My heroines seem to spend most of their time galloping around on horses and getting themselves into all kind of scrapes. Their day-to-day clothes are very much based on those worn by some of the more notorious female characters of Australian history. Mary Ann Bugg was the sometime wife of one of Australia’s more famous bushrangers, Captain Moonlight. Newspaper reports of the time describe her as looking like a young boy, wearing moleskin trousers, a thick shirt, a monkey jacket, knee length boots and a cabbage tree hat. The type of clothes a stockman of the day wore. Both my heroines in Lily’s Leap and Matilda’s Freedom are fiercely independent women, born and bred in the Australian bush. Although Lily grew up with many of the privileges of wealth, Matilda is the daughter of convict parents. Nevertheless, as we all know, at some point every girl needs a party dress. After a week on the road with a motley crew of bushrangers Lily arrives at her aunt’s house in Sydney and she has to conform. I chose this example from the Powerhouse Museum Collection as “her” dress. A few years later Matilda borrows it when she arrives in Sydney with only the clothes on her back after her family’s farm has been destroyed by fire. It’s fun to slip a little bit of reality into a story. This dress has an interesting history. It belonged to a Sarah Thomas. She brought it with her from England when she arrived in Australia with her husband as a free settler in the late 1830s. Sarah Thomas was an interesting individual and obviously (like me) had a preference for checks! 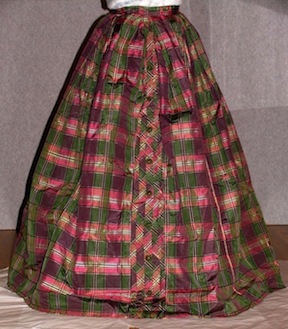 She made herself this skirt en route to Australia and wore it until her death in 1878 which, since she had ten children, is pretty amazing! You can find out more about Sarah, her story and her skirt here. Lily pushed back the blankets and peered around her in horror. The sun streaming in through the fine lawn curtains told her it was long past dawn and the time the horses should have been loaded. She reached her hand out to the pot of tea next to a cup on the bedside table. It was cold to the touch. 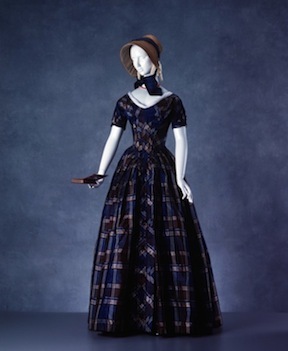 Shouting a string of curses she’d picked up from Jem, she scampered from the bed searching for her riding breeches, and failing to find them threw the checked silk taffeta dress over her head and shook her hair back while she fumbled with the mass of intricate buttons. With a pair of slippers clasped in her hands she ran down the stairs barefooted. His blood warmed as she approached and he saw the way her breeches hugged the sculpted curves of her thighs. ‘Good morning. I hope I haven’t kept you waiting.’ She turned to greet the horses and threw a smile at him over her shoulder. The outline of her buttocks as she turned away from him took his breath away. She was not even remotely self-conscious and looked more comfortable now than in the tartan dress she’d worn on the evening they’d first met. Her supple fingers caressed the neck of her bay mare, and the horse whinnied its approval. Note: Matilda is helping celebrate Lily’s release, and for a short time, Matilda’s Freedom is only 99¢ on Amazon! 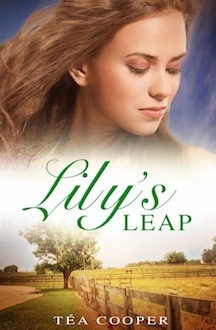 Lily’s Leap is Téa’s second Australian historical romance set in Wollombi. Her first, Matilda’s Freedom is available now. In October, Jazz Baby, a 1920s rags to riches story set in Sydney will be released and in February 2015, Forgotten Fragrance, Book I of a family saga entitled From the Ocean to the Outback. At the moment she is working on a parallel time-line series called The Adventures of Miss Abigail Wynter. 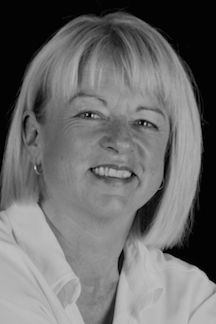 She has also written three contemporary romances.